Crostini are like little golden (brown) tickets when the holiday season rolls around. They’re incredibly versatile, endlessly delicious staples that make holiday dinners, cocktail parties, movie nights where whoever happens to be in town shows up, late night snacks in the kitchen after midnight present wrapping, and dinners made of leftovers a really tasty breeze. When it comes to these building blocks, quality is key. The best crostini aren’t overly complicated. They showcase a few ingredients—maybe an amazing cheese or some seasonal produce—which means that anything you add should play off and bring out the other flavors. It also means that you’re going to taste everything, so it all has to be great. 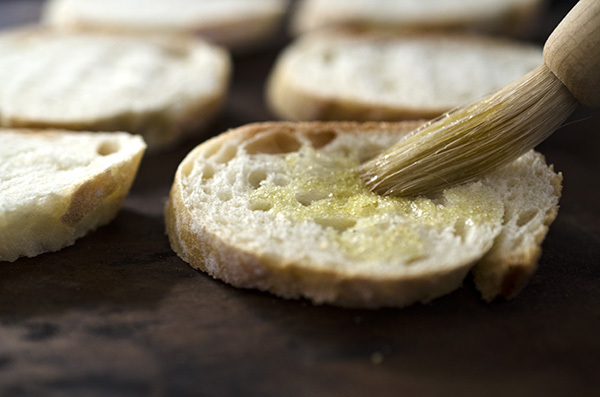 What takes the most consideration when it comes to crostini is selecting ingredients. Assembly itself is usually a snap. The olive oil you use is going to have a big impact on the flavor of your crostini. Change up your olive oil and you’ll change the whole taste. Some olive oils can be bitter—you should avoid those here. They may be fine for cooking, but definitely not for flavoring. An olive oil that’s fruity or grassy is going to be your best bet. We usually like Spanish or Italian olive oils best. They tend to be bright and fruity or grassy. There’s a lot to be said about olive oils. If you’re reading this and thinking, “Doesn’t it all taste pretty much the same?” It really doesn’t. Go do a taste test and see just how much the flavors vary. It’s kind of amazing. The way in which olive oils are described is often pretty similar to the way wines are discussed—a hint of this, background flavors of that. If you have a chance, check out the Yearly Index of the World’s Best Olive Oils. But what this all comes down to is that you should use whatever olive oil you love. In any case, make sure it’s extra virgin and, if possible, first cold pressed. These oils are where you’ll find the most flavor. 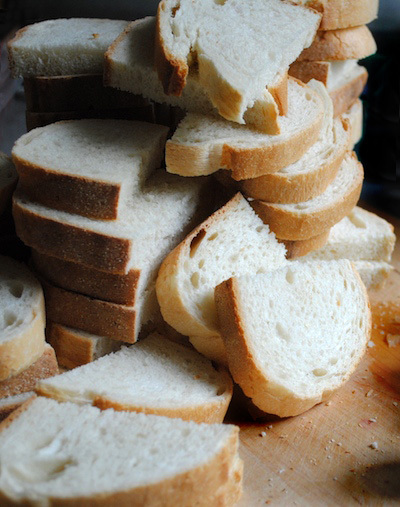 When it comes to choosing the right kind of bread, there are a few things to consider. Something with a nice crust and good chew is always ideal, but the kind of toppings you use will determine exactly what sort of bread and how you slice it. If you’re using bread that will give you smaller slices, like a baguette, it should be cut in about 1/2 inch thick slices. If you’re using a larger loaf, like a country-style bread, it should be sliced a bit on the thick side (about 3/4 inch thick slices). If you’re using a very rich or heavy topping, or if you’re serving a lot of different appetizers, smaller slices are nice so you don’t fill up on one. If your toppings are lighter and you only want to serve one per person, larger slices work great. As for toasting, here’s the secret: use your broiler. The trick to crostini is to brush the tops with olive oil and pop them under the broiler, toasting only one side so that it gets just the right amount of crispy, but the bottom remains a bit chewy. This makes them much easier (and more enjoyable) to bite into—it won’t crack or crumble all over you like a cracker. If you want to read more on bread for crostini, we’ve never seen the bread options for crostini explained so thoroughly and elegantly as they are in Franny’s: Simple Seasonal Italian (a GREAT present, by the way), one of our very favorite cookbooks from one of our very favorite restaurants anywhere. Once you’ve got your bread and your olive oil, there are so many glorious crostini waiting to be made—warm, salty, sweet, bright, fresh, roasted. Any kind you like. 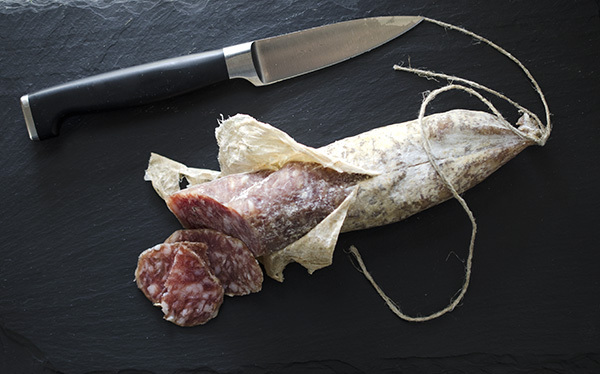 Fennel Agrodolce & Soppressata: spicy soppressata and fennel with balsamic vinegar that’s been sweetened just a tiny bit. 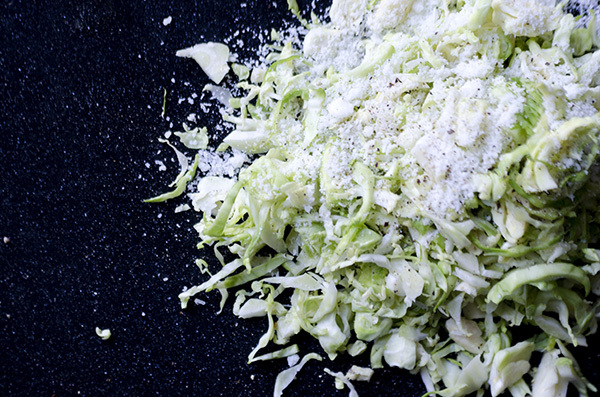 Once you’ve had raw Brussels sprouts this way, you’ll realize you’ve been missing out. 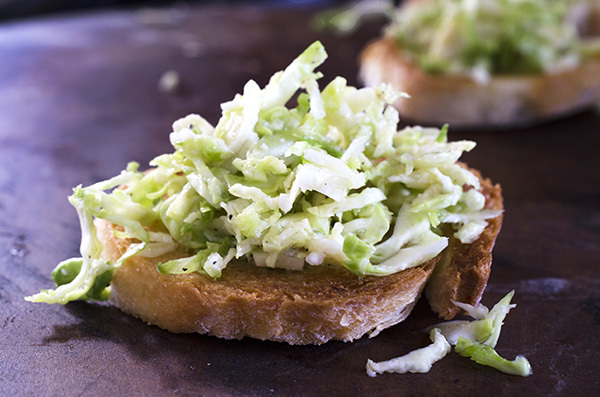 You can use thinly sliced fresh Brussels sprouts like cabbage—in slaws, in salads, on sandwiches. They’re a delicious. For our olive oil selection for these two crostini recipes, we used Italian for the fennel (because of its lovely grassy, bold flavor) and Spanish for the Brussels sprouts (for its softly fruity flavor). Man oh man oh man. Happy holidays, indeed. Notes: Depending on what you are topping your crostini with, you can slice it in rounds or on angle to give you a larger surface area. * Slide your oven rack into the second slot from the top space and turn on your broiler. * Broil for a few minutes until toasted—watch carefully so they don’t burn. 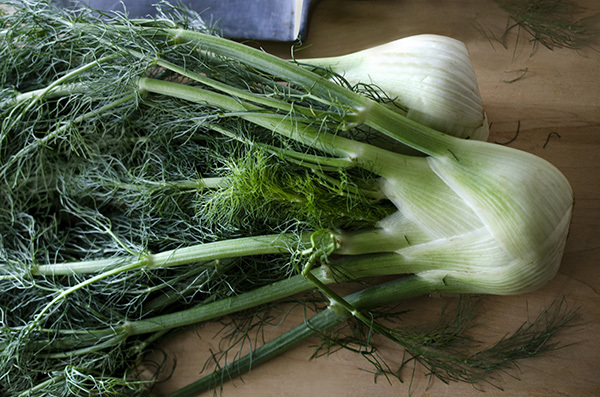 * Wash the fennel and remove the outer stalks if they are discolored. Thinly slice the bulb and tender pale green stalks, reserving some of the fronds to garnish. * Warm a sauté pan over low heat. Add the oil, water, balsamic, sugar, and salt. 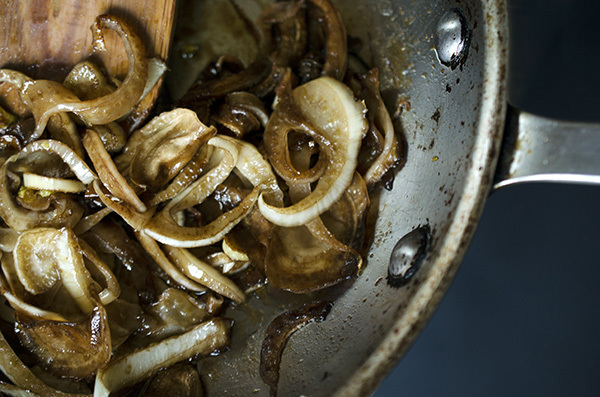 * Add the fennel and give it a stir. Raise the heat to medium. 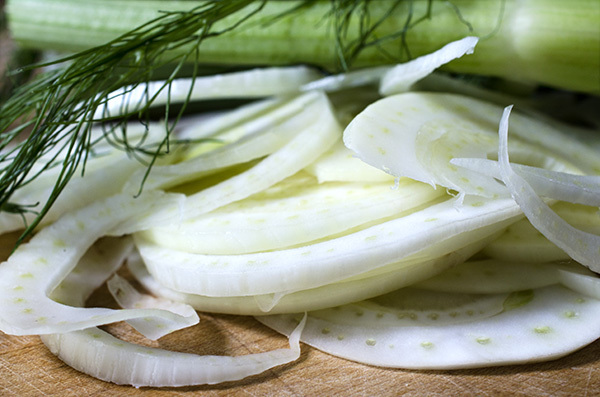 * Cook uncovered until the fennel is soft and the liquid has reduced—it should have just about evaporated. If the liquid is evaporating too quickly (before the fennel has softened), cover and add a little more water if needed. 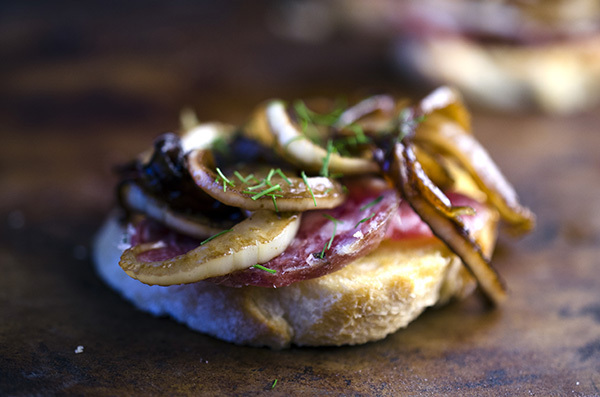 * Place two slices of soppressata on each of the prepared crostini and top with cooked fennel. * With a scissor, snip up some of the reserved fennel fronds and sprinkle on top. 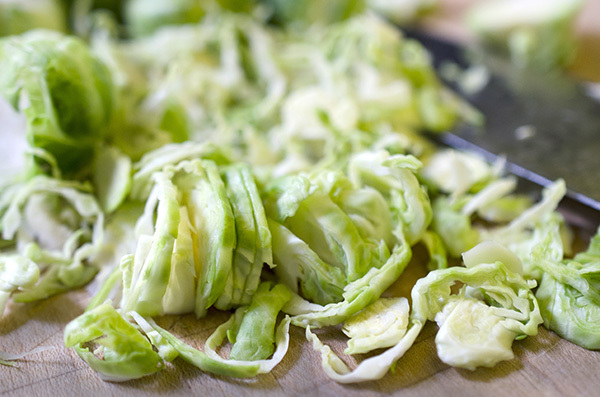 * Clean up the Brussels sprouts by peeling off the very outer leaves and cutting or a bit off the bottom. Give them a rinse and dry. * Slice the sprouts very thinly and place in a bowl. You can use a food processor to slice them up instead, but we find it weirdly meditative to do it by hand (depending on our mood and how much time we have). * Add the lemon juice, Pecorino, and enough olive oil to dress the sprouts. Toss and divide it among your crostini. * Finish the crostini off with a little sprinkle of sea salt right on top. © Lee and Lou Cook 2014. All rights reserved. Looking for something else? Poke around! Hi there Kate. Thanks! Been at it a very long time. I have to say though that not every image is mine. Lee is one fine photographer! Check out her other work on Handful of Salt. Click below to follow Lee and Lou! You'll receive a note by e-mail when new posts go up.